Download Sony's new racer for a low fee of zero dollars, courtesy of Scion. Do you drive a Scion? Do you want to drive one? Do you even like these vehicles? Silly human, your opinions don't matter. Just know this: Scion stepped up in a big way, teaming with Sony to make MotorStorm RC free to PlayStation Vita users for a limited time. PS3 fans, meanwhile, must fork over $9.99 ($7.49 for PlayStation Plus subscribers). There's a logical explanation for this, of course, that being good old fashioned advertising. 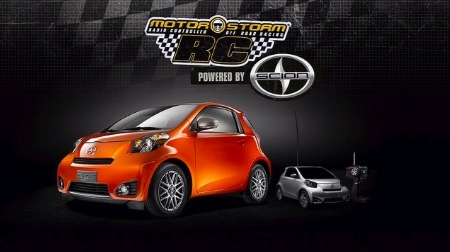 There's a PS Vita exclusive Scion iQ just begging for a test drive. Of course, you don't have to bother with it, instead opting to mess around with RC Buggies, Superminis, Rally Cars, Muscle Cars, Racing Trucks, Supercars, Big Rigs and Monster Trucks across 16 different tracks. The game launches today, so be sure to take full advantage of this sweet deal.